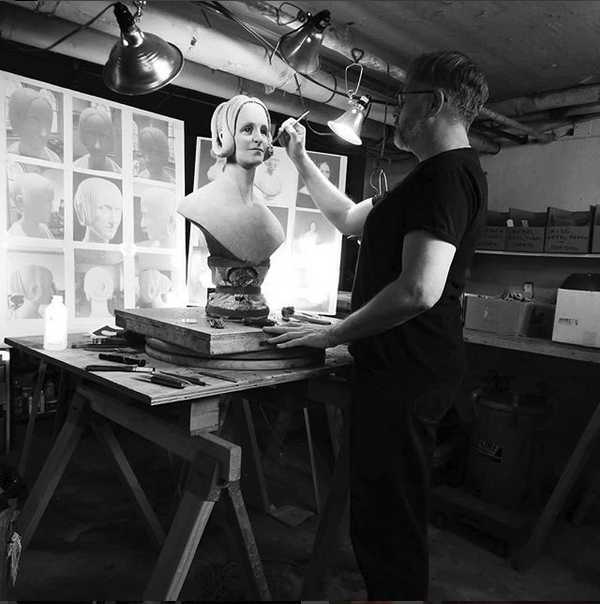 Just in time for Halloween, celebrated sculptor Bryan Moore will unveil his latest bronze creation—a bust of beloved author Mary Shelley—on October 21st at the the Museum of Pop Culture (MoPOP) in Seattle, Washington. The unveiling marks the 200th publication anniversary of the legendary novel Frankenstein, and will be accompanied by a guest lecture and presentation by Les Klinger, author of The Annotated Frankenstein. This is the second bronze bust donated by Moore to MoPOP, the first being Bram Stoker in 2017, Mary Shelley in 2018, and finally Rod Serling in 2019 in celebration of the 60th anniversary of The Twilight Zone television series. Since there are no photographs of Mary Shelley, Moore’s primary reference for her likeness was the famous Richard Rothwell painting of 1840 and the Camillo Pistrucci marble bust of 1843, both created in her lifetime as she likely sat for both artists. Moore has been long celebrated for his busts of iconic horror writers, including H.P. Lovecraft, Edgar Allan Poe, Bram Stoker, and Mary Shelley, which can be found in the halls of the Providence Athenaeum Library, the Boston Public Library, the Dublin Writers Museum in Ireland, the MoPOP, as well as being featured in in the Guillermo del Toro exhibit “At Home with Monsters” at the Los Angeles County Museum of Art, Minneapolis Institute of Art, and Toronto’s Art Gallery of Ontario. Visit www.theartofbryanmoore.com to find out more about the unveiling and make sure to follow Bryan Moore on Facebook, Twitter, Instagram, and Youtube for news and updates on all upcoming projects.